Whereas The Testament of Mary is offered as a more accurate account of her son, who had been making a commotion, “whipping up the hysteria of the crowds” with wild talk (which Mary could not bear to hear, because his voice was “all false”). Mary’s account made me think, for the first time, about how agonizing it would be to witness the torture and execution of one’s child: not just causing sorrow—the emotion we associate with Mary—but also raw pain and fear. The book presents some of the miracles, such as the raising of Lazarus and the making of wine at Cana, in a different (and plausible) light. In many ways, this book readily reminded me of Paul, Howard Brenton’s the play about the apostle, which also re-imagines the Jesus myth and casts aspersions on the motives of early church founders. I don’t know if I’m any more convinced by Mary’s version of the story, finally, than I am of the original. She has her own reasons for wanting to persuade us. One small detail stands out: when Mary recalls the time, during Jesus’s preaching, when she was trying to keep a low profile, she says “this great disturbance in the world made its way like creeping mist…in the two or three rooms I inhabited.” This woman of modest means can’t remember whether her home had two or three rooms? 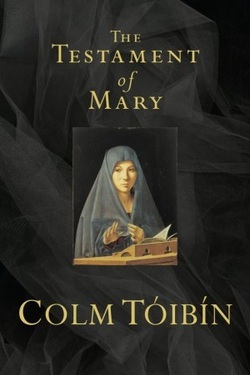 Not sure if Tóibín included that small misstep deliberately, or accidentally, but it made me question Mary’s story, too. As we should question all stories—told by mere mortals—about gods and saviors.